While data shows that the percentage of Americans banking online is increasing, interestingly enough 45 percent of Americans have been to a bank in the last 30 days. So, the question I ask is: When you did go to the bank did you have an engaging and memorable customer experience? Most likely if you take a poll of your friends, the answer is no. The challenge is not “will your brand thrive?” in the years to come, but “will you survive?” You can change the outlook of your brand by looking at the greater retail industry. Retail is embracing new generations. For the last 10 years, all the chatter has been about millennials and how to appease their desire for ease of transaction. We’ve done this by simplifying their online and in-app user-experience. Shockingly however, only one third of the top 30 financial institutions offer end-to-end account support online. On the retail front this is exemplified by the proliferation of brands such as Amazon or Alibaba. Nothing is easier than shopping online and having a package delivered to your door in the same day. The impact has caused many brands to close locations, and introduced a need to refocus what their real estate portfolio is for, or if they need one at all. 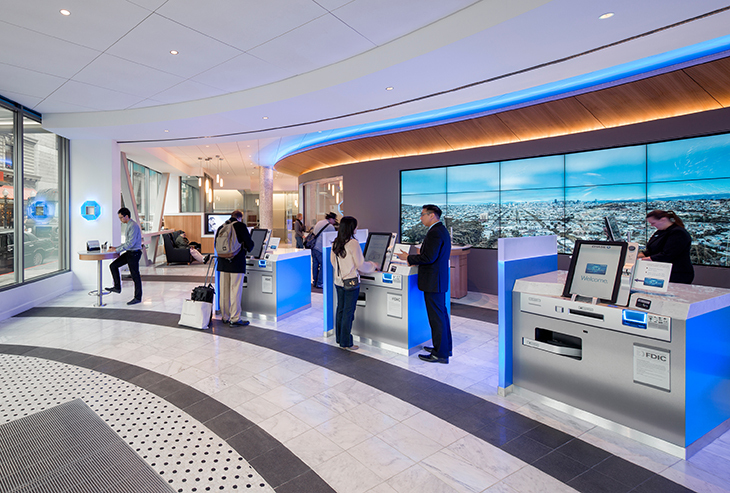 Banks can take a cue from the retail industry: successful digital integration allows for unique and personalized customer experiences. Harman Kardon NYC Flagship and Prototype. Photo © Christopher Payne. You also can’t afford to ignore the reality of Gen Z emerging as customers and beginning to enter the workforce. Studies reveal 77 percent of Gen Z consumers in the U.S. prefer to shop in a physical store. We need to stop focusing on what has happened in the last 10 years and start talking about how Gen Z is going to disrupt the industry for the next decade. The biggest differentiator of Gen Z compared to other generations is that they never experienced a life before the Internet. They have always been connected and oversaturated by the Internet and social media. The retail market last year also reflects a return to physical connectedness: according to IHL Group, for every U.S. retail store closing in 2017, there were 2.7 store openings, and this is projected to increase for 2018. In the banking world, industry executives overwhelmingly say that branches are still a necessary channel for their customers. Ok, so physical banks aren’t going away and there’s clearly a need to keep these facilities as a sales channel. However, we need to shift the perception of what a branch is for. Stay tuned for my next post, where I will discuss ideas for how to make physical bank locations successful. Ryan Cavanaugh is an architect in Gensler’s Atlanta office focused on retail spaces. His passion is in bringing a brand to life in a physical space. By putting the customer first, Ryan is able to create truly unique experiences that combine emotional and sensory elements with architecture. Contact him at Ryan_Cavanaugh@Gensler.com..